Gyazo is a free web service with a desktop app and browser extension that lets you instantly capture your screen and share. It also has many features in addition to screenshots that make it easy to save and collect anything you see, in almost any format. So, there are a few other ways to conveniently upload images beyond the regular screenshots. You can upload png, jpg, or gif file formats quickly by following the steps below. If you are a Google Chrome user, get the Gyazo Extension to easily grab images from any website with a few different options. You can capture a page element, a selected area, and the visible part or all of a webpage. Also you can right-click an image to capture directly, and see instant previews of Gyazo images simply by hovering over the link on any site. If you use Firefox, get the handy new Firefox add-on at the link above. It has the same features and functionality as the Chrome extension: you can capture a page element, a selected area, and the visible part or all of a webpage. And you can also right-click an image to capture directly, and see instant previews of Gyazo images simply by hovering over the link on any site. Note: For windows 7 or later, you can drag & drop an image file into the Gyazo Icon on your desktop, but you can't do that with the Gyazo icon in your task bar. You can upload jpg/png/gif format images from your computer directly via the web browser, without launching any desktop apps. Try this handy feature on your captures page. 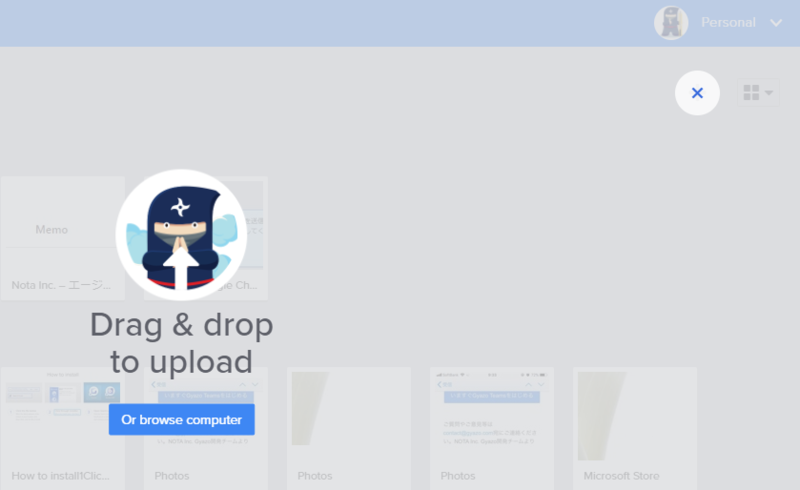 Once on the home page, click the upload icon here and drag and drop your image file. You can also browse for the image(s) you want to upload by clicking "Or browse computer". 4. upload image file(s) directly on captures page. It is useful when you want to upload multiple images at one time.